Perikanan Melaka's department will test type hook 'Circle Hook' to replace 'J Hook' to be used state fisherman this year in efforts reduce deaths species not target that falls victim catch. Type hook Circle Hook test fisherman Terengganu since early last year found effective reduce protected species mortality as turtle, sea mammal or fish sailing, in fact succeed increase revenue their catch. Furthermore, hook 'stainless steel' this increasingly popular his use in United States and Canada supply fish tuna yellow fin (Thunnus albacares) and enhance continuity rate for species who is not target. Jabatan Perikanan Melaka's director, Zawawi Ali, said for the purposes of that his team ready to lend 20 hook this kind to be tested fisherman those interested and simultaneously help department promote his use in the future. This hook design lined upright to fetlock and nearly circular (curved inwards), over vertical J Hook parallel (resemble letter J). 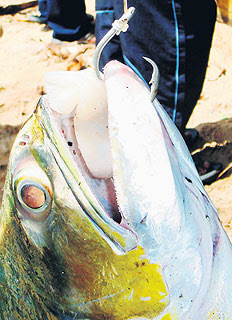 *Way-it function that is when fish or fisherman move, hook would be attracted to side part fish mouth. End of a hook will catch side part instead of it mouth as make J Hook renders it got caught on the inside mouth, gill and throat. *The curved form is designed so fish difficult to want escape although on the rope slack, it safe uses including less risk got caught to coral or boat top and very effective hold living or dead bait. *This hook give to life high rate on fish those caught, over J Hook sometimes before raise into the boat that catch revenue already dead. At the same time J Hook's hook comply affecting yield catch and raise injury to toe. Most important this hook fulfill international association will to make sure fishery activity a more responsible (CCRF), reduce deaths turtle (FAO AND IOSEA) and deep ASEAN determine fishery and resource management make by steady. Study also found Circle Hook not hurt turtle because centre this hook curve no easy to hang at any that vertebrata parts of animals, simultaneously could kill fish.